Twenty-year old Hla Ko* has an easy smile, a cool haircut and the manic energy of a young man with few ties. He studies medicine but adores politics. He has an opinion about everything but isn’t too sure about anything. The church is an anchor, but hanging out and flirting with his many female friends is how he spends a lot of his time. If Myanmar manages to pull off free elections next year, Hla Ko — a refugee living in a Thai border camp — will consider going back. In the meantime, however, wracked with anxiety over his lack of clarity and suffering from nearly a decade of cabin fever, Hla Ko is slowly losing it. “It’s like a jail in here. I’ve stayed here for seven years and I have no knowledge of the outside world,” he said, as we walked around a football pitch where boys tried futilely to burn off some energy. “I don’t like it so much. Seen from above, the roofs of Mae La collapse upon one another. Some 40,000 people live in this Thai refugee camp that sprawls along a lush, hilly border. Of nine camps housing an estimated 120,000 refugees, Mae La is by far the largest and, at a glance, resembles nothing more than an unusually dense rural village. Ignore the Thai guards posted at the entrance, ignore the random security checks, ignore the massive warehouse of rice that can be accessed only when it is time to collect monthly rations, and Mae La is like any other village except that almost everyone is obsessed with what the future will bring. For the camp’s younger generation, that concern is especially acute. More than 60 percent of Mae La’s population is under 25, according to the UNHCR, and many have little or no firsthand knowledge of Myanmar. The information they’ve gathered comes from the internet, teachers and often traumatized family members. The bulk of the refugees here are ethnic Karen — one of Myanmar’s largest minorities — and a group that has been locked in near perpetual war with the Myanmar military for six decades. Their faith in government guarantees of peace and prosperity is paltry, at best. “The ceasefire is not real,” said Hla Ko, expressing an opinion that every refugee I spoke with echoed. “The real story is Myanmar’s military is just doing it for show. They go to Yangon [with Karen army leaders] and take a photo but there’s still fighting. With each passing year, however, that possibility lessens. Nine years ago, in a bid to halt new arrivals, Thai officials announced an end to UN registration. Without access to the registration, refugees who arrived after November 2005 have no right to be resettled in a third country. The aim was to make the camps a less desirable option (while most residents have come fleeing fighting or land confiscation, many enter with the sole aim of applying for US or Australian citizenship), but with little improvement in Myanmar, the move missed its mark. The camp population has remained fairly steady, but with each passing year the portion of residents stymied by the insufficient options grows. The final nail in the coffin for many came in January, when the US stopped accepting applications for what had been the largest resettlement program by far. Soe Soe, a classmate of Hla Ko’s, has lived in the camps for eight years and has found herself chafing at her narrowing options. A confident and eloquent speaker, the 21-year-old doesn’t mince words as she describes the situation. “We are under the Thai government. We are not free. We can’t even leave the camp and that’s why we get depressed. We don’t have opportunities and we cannot cope with it,” she says. The change in the resettlement scheme has coincided with worsening camp conditions, creating a perfect storm of discontent. After Myanmar was declared “open” in 2011 following a series of ceasefire agreements, international aid agencies began diverting funds from the border to the center. Though the truces have repeatedly broken down and rights groups warn that Myanmar is far too unstable for resettlement, focus and money shifted far from the camps. Rice rations have been cut and salaries lowered at camp-sponsored jobs. At some camps, said residents, clinics have shut down. At others, educational and vocational training programs were ended. To cope, many refugees began cultivating land inside Myanmar or taking on illegal migrant jobs outside the camp. Though dangerous, the jobs brought in much needed cash for families. But in May, the newly installed Thai military junta put an end to that, putting in place such extreme security measures at the nine camps that leaving has become all but impossible. “The refugees have no idea what is going to happen to them, and the rumors circulating the camps only make refugees more afraid and worried. The refugees seem to be the last to know what will happen to them, and the last to play a part in any planning,” said Ariana Zarleen, a co-founder of the Mae Sot-based Burma Link. In 2012, repatriation discussions began in earnest. The Thai government has publicly insisted it won’t force people back and the UNHCR has promised it has Thailand’s assurance of voluntary repatriation, but many remain skeptical. For one, the government has previously let slip that return should be imminent. In July, army officials repeatedly told the media the time was nearing for repatriation. “There are around 100,000 people who have been living in the camps for many years without freedom. Thailand and Myanmar will help facilitate their smooth return,” army deputy spokesman Veerachon Sukhontapatipak told Reuters, just weeks before another official reportedly called it “a good time” for a return. For another, despite international pressure, Thailand has never signed on to UN conventions that would ensure refugees couldn’t be sent back. “The framework of international principles that recognize the inherent dignity and the equal and inalienable rights of everyone to be universally protected, has little significance to refugees who live in Thailand,” said Zarleen. In the past, Thailand has shown little compunction over favoring geopolitical expediencies above the human rights of refugees. Four thousand persecuted Hmong asylum seekers living in camps were shipped back to Laos in 2009, after the Thai government deemed them illegal immigrants. More recently, thousands of Rohingya asylum seekers have been deported and Thai officials’ collusion in human trafficking schemes has been well documented. “The Thai government says it should be a voluntary return, a return with dignity, but we’re worried it will be forced repatriation,” said Saw Way Lay, advocacy coordinator at the Karen Human Rights Group. That fear has pervaded the refugee community. “The minute people start talking about refugee repatriation, it affects their mind,” he said. Soe Soe and Hla Ko are in agreement that the Thai government “wants to force people back to Myanmar”. Residents of other camps offered similar evaluations. At the Mae Tao clinic in Mae Sot, refugees there to receive medical treatment spoke about their fear of returning. 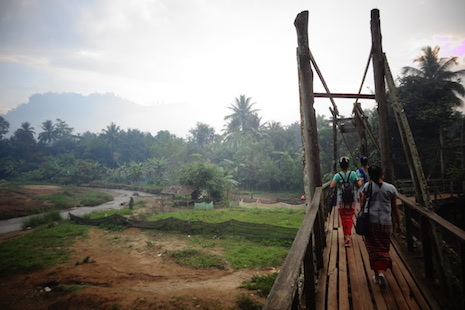 At Mae La-Onn, said Paw Htoo, a 20-year-old who was born and raised in the camp, “repatriation is talked about a lot”. Given the squeeze within the camp, some have begun self-repatriating in dribs and drabs. “We can say they’re testing the water softly, but we cannot say how many,” said Way Lay. Precise figures are hard to come by because many return for the annual ration registration, but those working on the border estimate at least a few hundred move to Myanmar each year. Some following the situation say they have little doubt this is part of the overall plan: When conditions become so dire that people leave of their own accord, repatriation becomes less of an issue. “Some refugees already feel forced to go back as surviving in the camps is becoming more and more difficult,” said Burma Link’s Zarleen. If the uncertainty has led to anxiety, it has also exposed a generational rift. As the country slowly appears to be opening, many of the younger generation are for the first time wondering if Myanmar might in fact prove the answer to their predicament. “Many of our students want to go back and help their own people. They want to be in a leadership position,” said Kany, an Indian woman who came to teach at a school in the Mae La camp two years ago and has yet to return home. Kany said teachers were increasingly encouraging students to “help the people,” as Myanmar grew seemingly more stable. But they are also suggesting return in response to the pervasive malaise seen among the camp’s youth. On a busy corner of Mae La’s Zone C, customers dodged groups of racing children to drop in to 59-year-old Naw Thin Thin’s shop. Housed in an expansive home, the shop serves primarily as a way to fill her days now that all but one of her eight children have left. Her children feel differently, she admitted. Among the eight raised in the camp, two returned to Myanmar, four live elsewhere — one in Australia, the others in Bangkok. The youngest, a 20-year-old, worked illegally in Bangkok for a year before his sister eventually implored him to return in the wake of the junta’s crackdown on migrant workers. “It’s hard for him here,” she said, as he and three other tattooed teenagers drifted in to help prepare dinner. *Residents of the border camps are identified by pseudonyms unless they explicitly asked to be named. Most said they did not feel comfortable having their real name revealed for reasons of personal security. **This article first appeared on ucanews.com on December 15, 2014.